Click on the images to purchase tickets! The Anderson twins ripped it up this summer at the Northeast Jazz & Wine Festival – so we’re bringing them back for another swing throwdown to kickstart our season. “Virtuosos on clarinet and saxophone” (New York Times), these identical twins and Juilliard graduates are known for their unique renditions of classic jazz songs and innovative original music. The Andersons have performed with the Lincoln Center Jazz Orchestra, Village Vanguard Orchestra, Wycliffe Gordon, Cecile McLorin Salvant, Paquito D’Rivera, Wynton Marsalis, and can be heard on the Grammy-winning soundtrack of HBO’s Boardwalk Empire with Vince Giordano’s Nighthawks. They’ve headlined at The Blue Note, Jazz at Lincoln Center, The Kennedy Center, New Orleans Jazz Festival, Feinstein’s 54 Below, and live on Garrison Keillor’s A Prairie Home Companion. It’s time Syracuse got to know them, up close and personal. Are you seeing a pattern here? The legendary Marcus Anderson, veteran of Prince’s New Power Generation band, headlined our summer festival with the most exciting, over-the-top show imaginable, bringing thousands to their feet to close the celebration. He’ll hold court in the Finger Lakes Ballroom and do the same, in celebration of Black History Month! Charting number one on Billboard’s Smooth Jazz and Sirius XM’s Watercolors, this Spartanburg, SC native’s work with the late Prince led him to collaborations with Ceelo Green, Judith Hill, Stevie Wonder, Sheila E, and many others. A busy festival performer worldwide, he has performed for President Barack Obama, Jesse Jackson and Hillary Clinton. His exciting blend of R&B, Pop, Rock, Latin and Funk will bring you to your feet again at this exclusive CNY Jazz show. Finishing our Trifecta is yet another triumphant return engagement, featuring the multi-talented and entertaining Ron Wilkins, master of low brass and jazz vocal technique, who will mix it up with our own vocal treasure Ronnie Leigh, in a reprise of their rousing, rip-roaring concert at last January’s festival fundraiser. An icon on the NYC jazz scene, Ron’s uncanny musicianship has led him to perform with the world’s greatest artists – Ray Charles, Aretha Franklin, Rosemary Clooney, Lena Horne, Jerry Lewis, Dizzy Gillespie, and Jimmy Heath among them, and groups such as The Vanguard Jazz Orchestra, Arturo O’ Farrill and his Afro-Latin Jazz Orchestra, The Dizzy Gillespie All-Star Big Band, the Count Basie Orchestra, San Antonio Symphony and Festival Orchestra, Austin Symphony and Austin Pops, Victoria Symphony, Temple Symphony, and other orchestras as Pops Series solo artist. You’ll be blown away by this show. All we can say about this season closer is – it’s not for the faint of heart, so bring your meds. But if you forget – what a way to go! CAN’T DECIDE? DON’T MISS ANY! 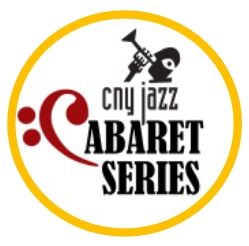 SUBSCRIPTION TO ALL THREE CABARETS $85 (OFFERED THROUGH NOV 9th) – and never a ticket surcharge! The SHERATON SYRACUSE UNIVERSITY HOTEL & CONFERENCE CENTER, please CLICK HERE. The MARRIOTT SYRACUSE DOWNTOWN, please CLICK HERE.